Busch Pressman Reno race | Windsor Photo Outfitters...Exposed! 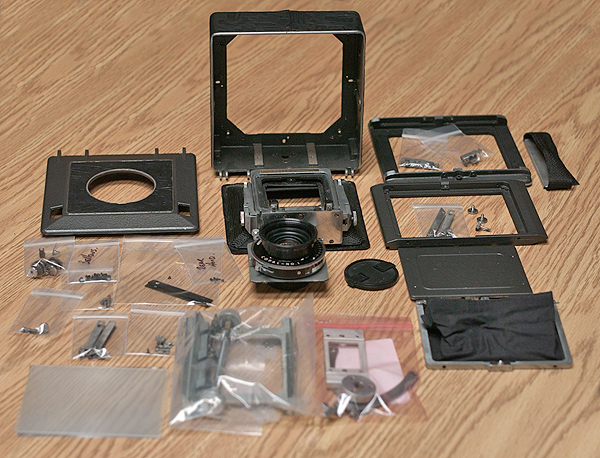 October 2011 – Thierry and Adrian got their Busch Pressman 4×5 cameras back together. So who won the race? Thierry looked into getting his camera’s metalwork anodized. However, the only people he could find who do that kind of thing specialize in customizing bicycle parts. The cost would be quite high to get each piece done – still, he says he is still considering it. Adrian struggled getting the cosmetics right on his camera (which was in fine working order at the beginning of the race – so it wasn’t an evenly matched field). He really wanted to go for a bolder green/brown colour scheme – which as he puts it, is the kind of Pressman Busch should have made available back in the ’50s. Green hammertone paint was available in Canada a decade ago. Not anymore apparently – and it’s not all that easy to find in the US. Fortunately, an internet search turned up a couple of spray cans, and made the colour change possible. The brown leather also isn’t as easy to find as you might think. Adrian finally found some to his liking by buying a vintage cowhide suitcase from a thrift store – right colour and thickness. The focus knobs were painted with that faux anodizing spray. Adrian’s green Pressman has been out and about several times, including his photo shoot of the Kawartha region in August 2011. Thierry has also confirmed his works well, especially with the 120mm Angulon lens (which a jealous Adrian agrees is probably ideal for the Pressman – his 90mm Angulon is often a pain on the short focus rails). Both cameras were a heck of a lot of fun to renovate. Both look great. And both take excellent images. Busch’s Pressman 4×5 Model D may not be perfect, but for someone doing large format on a budget, it would be hard to find a camera with the features, small size and potential for beautification for this kind of money. February 2010 – Watch as Adrian Harte and our customer Thierry Martin race to refurb a Busch Pressman 4×5 Field camera. Check here for updates, and photos and watch the progress. As can be seen in the photo below Adrian is off to an early start on his refurb. Google Busch Pressman to see what these gorgeous cameras SHOULD look like. Adrian’s BP freshly dissassembled, now off to paint stripping. Adrian says … You may wonder what this project is really all about. Well… some years ago, I found I owned two Busch Pressmen Model D. The first was in quite nice condition, and was in its original “press camera” setup – meaning it had a pop-up wireframe finder, another small viewfinder, and still had the side-mounted Kalart rangefinder. None of which I needed for my purposes. So I stripped them off and happily used the camera. However, it had one annoying attribute – I could only close up the camera with a small lens/shutter combination. ie: a vintage Schneider Angulon. My larger lens had to be removed to close the camera and put it in a bag. Then another Pressman came my way. This one was in serious need of restoration (missing paint, missing some leather, and more than a bit corroded). So I decided to cut a neat hole in the front cover, allowing the camera to close up with the larger lens still on board. I replaced the leather, polished up what needed it, and painted it. It worked so well, I put the first camera back to original configuration and sold it. But then I realized that I had wimped out in my customization of the second camera. Why, oh why, did I paint it dark gray, and use black leather. What a bore!! So when Thierry spoke of customizing a Pressman, inspired by my old camera, I decided to up the ante with a restoration of my own. The good news… it’s almost done. It’s going to look way cooler than the bits you see above. Stay posted.